Detectives investigating a serious assault in Chingford last year have released an image of a man they wish to identify. Police were called to Chingford Mount Road, E4 at 16:55hrs on Wednesday, 25 October 2017 following reports of a man suffering from serious injuries in the street. In the lead up to the attack, the victim, a 53-year-old man went to Barclays Bank accompanied by two companions, intending to withdraw cash. The bank was closed, but the victim could see a customer inside the branch. A short while later the customer inside the branch was guided out of the bank by a member of staff. The victim and his companions began walking along Chingford Mount Road away from the bank when the victim felt a blow to the side of his head and fell to the floor. The suspect, the man they had seen earlier inside the bank, made off on foot towards New Road, E4. 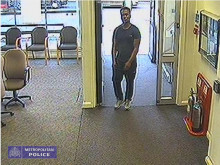 The suspect is described as a black man, with short dark hair and wearing white trainers, a dark coloured t-shirt and blue tracksuit bottoms. The 53-year-old man was taken to an east London hospital with a fractured jaw. He has since been discharged from hospital. Detective Constable Noble Adu Agyapong from Waltham Forest CID said: “Eight months has passed since this violent and unprovoked attack and I am committed to finding the person responsible. Anyone with information is asked to contact Waltham Forest CID by calling 101 and quoting CAD 5690/24OCT17, tweet @MetCC or call Crimestoppers anonymously on 0800 555 111.